EVANGELINE opened in Edmonton last night as the flagship entry of the Citadel’s 50th Season. The musical is important for many reasons, namely the fact that it is being billed as the largest Canadian musical ever. It’s been over a decade in the works and is the brainchild of writer, actor and pianist Ted Dyskstra, who conceived of telling a uniquely Canadian story based on the Acadian expulsion of 1755. The result is a sweeping and epic musical reminiscent of Les Miserables but with an appropriately Canadian twist. 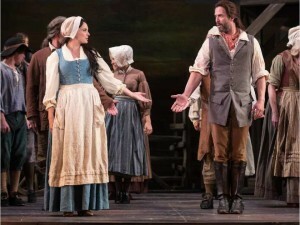 The show is loosely based on the poem “Evangeline: A Tale of Acadie” by Henry Wadsworth Longfellow, but it has been fleshed out by Dykstra and now the story of Evangeline’s lover Gabriel is just as central to the tale as that of the heroine. Evangeline is important for so many reasons, not the least of which being that it is quite the feat to get a Canadian musical of this size off the ground. But it also tells an important story of the plight of displaced people and the importance of being a welcoming and free society. It may not seem important to people viewing it in 2015, but Canada was not always the inclusive nation it is today and that’s something everyone needs to remember – especially in light of recent events around the world. The show itself is at its core a romantic one, showcasing the love that Evangeline and Gabriel have for each other as well as the love the Acadian people have for their neighbours, their friends, their God and their freedom. Their struggle feels real and makes their plight all the more heartbreaking. Josee Boudreau’s Evangeline is a beautiful character – her kindness radiates throughout her performance and her determination to stick to her core beliefs (namely that there is good in everyone and that non-violence is always the best path) makes her both likeable and admirable. Separated from her new husband Gabriel (Jay Davis), she sets off on a lifetime journey to reunite with her love. Making friends along the way, she inspires others to recognize that kindness is a way of life and violence isn’t always the answer. Her betrothed (Gabriel) doesn’t necessarily share her optimistic viewpoint but refrains from violence at her request. When the men of their village are taken by the British and informed that they will be exiled, he lashes out (justifiably) at a particularly smarmy British soldier Hampson ((Réjean Cournoyer). This single act of violence sets the tone for Gabriel’s story arch as he comes to believe that not only is Evangeline dead, but that his actions were the cause of her untimely demise. We watch as he retreats into himself, a man struggling to come to terms with lost love and his new place in the world. Boudreau and Davis work beautifully together, and while they are apart more than together, you truly believe that theirs is a love that transcends separation, difficulties and even death. Their voices compliment each other and Bob Baker’s direction is beautifully nuanced when he brings them together on stage for sweeping duets that show them continuing to search for each other. The ensemble works well together and embodies the spirit that is so central to the story. Brent Carver’s Father Felician is a stand-out, we watch him go from devout believer to a frail, conflicted and pained outcast. It’s always a treat to hear Carver sing, but his character’s transformation was also a delight to watch. Julien Arnold, Stephen Guy-McGrath and J.D. Nicholson provide comedic support as the men of the Acadian village, and Guy-McCrath’s violin playing was a welcome diversion from the heartache unfolding on stage. Leslie Murdoch brings compassion and consideration to the role of Colonel Murdoch, the man tasked with overseeing the expulsion of the Acadians. He has a lot of lengthy dialogue but you can tell he is a man struggling to come to terms with his duty to his country and what he believes to be ‘right’. Finally, as Hampson, Rejean Cournoyer makes for a truly vile villain, the type that you love to hate. Mark Cassius shows up in Act 2 for a show stopping number that had the audience clapping along, espousing the virtues of freedom and inclusion with radiance and joy. The set design by Cory Sincennes is impressive both in scale and usability, with many moving pieces that help propel the story throughout the decades. The 14 piece orchestra (conducted by Don Horsburgh) sounded beautiful inside the Shoctor Theatre, and on the group numbers the voices soared to the rafters and reminded everyone of the beauty of live theatre. In the end, Evangeline could still use a bit of work, but it shows tremendous promise. It’s a fantastic story that has all the crucial elements that make good theatre – drama, intrigue, conflict and of course, a love story for the ages. Its beautiful music and classic story telling serve as a reminder to us all of how fortunate we are to live in the Canada that we enjoy today. I hope the theatre community in Canada embraces Evangeline with the type of blind optimism we see in the shows heroine, and may that optimism give it legs to be performed all over our great nation.